Ce condo est à quelques pas de la zone de la piscine magnifique! Appareil est livré avec toutes les commodités! Récemment mis à jour avec des planchers nouvelle tuile dans le salon, Nouveau tapis dans la chambre et nouvelle carte de base à travers. Cuisine, salle à manger, salle de bain et des zones préalablement carrelées. Armoires de cerisier, comptoirs en granit et entièrement meublé. Grand patio extérieur avec table et chaises pour profiter de ces soirées chaudes de l'Arizona. Laveuse / Dyer dans l'unité. Sèche-cheveux aussi disponible. Chambre a un lit queen size, draps supplémentaires. A aussi commode, beaucoup d'espace de rangement et d'une télévision à écran plat monté sur le mur. Il ya un service DirecTV et câble pour les chaînes locales. Le service téléphonique, les appels locaux seulement. Le salon a un canapé, une chaise et un pouf. A également la télévision à écran plat monté sur le mur. À proximité des commerces et centres commerciaux. Sun Devil Stadium, à environ 5 miles SW, Peoria Sports Complex, à environ 25 miles NW, aéroport Phoenix Sky Harbor, environ 6 miles SE. Parcours de golf en abondance! Partout. Nice unit, nice location. Actually stayed the month of February. The unit looks exactly like the pictures, very comfortable and spacious and well equipped. The location is within walking distance to restaurants, grocery stores, Walgreens and, if you like to walk, it is only a 15 to 20 min. walk to Old Town and The SF Giants spring training facility. There is an executive golf course right behind the complex. Some units (not this one) face the 8th and 9th hole. The grounds and the pools are well maintained. I would stay here again and recommend it to my family and friends. I'm so happy you enjoyed your stay and thank you so much for choosing our Condo for your vacation. We hope to accommodate you on your next visit. We spent one week in this unit in February. The condo is immaculate, nicely furnished and very comfortable for the two of us. The grounds are well-kept. We didn't have occasion to use the pool but enjoyed sitting on our private patio in the evenings. One nice feature of this condo is that Cathie does not have a set checkout time and we were able to stay in the condo until mid afternoon before leaving for the airport. great location and nice clean accommodations! Spent 6 nights at this condo last week and have absolutely nothing bad to say. Great first floor unit right by the pool. The pool had very comfortable chairs and was clean. It is one mile to Old town Scottsdale which had several restaurants and entertainment. We highly recommend this place! We spent 45 days in this unit. The floors have been recently tiled and new carpet in the bedroom. The unit is well appointed and has everything you will need for an enjoyable stay. Last year we stayed at an adjoining unit which was somewhat "dark". This one is just the opposite, very light and cheerful ! You "can't" beat the owners. They are more than helpful and will do everything possible to make your stay uneventful and enjoyable. 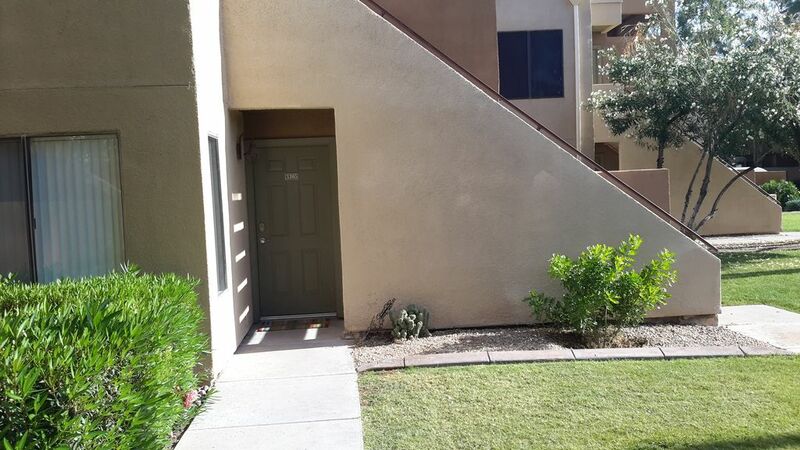 This unit is located in Sunscape Villas which is located very near Old Town Scottsdale. It is an easy walk to the center of town (about 20min) and grocery shopping is just across the street. If you enjoy golf, the unit adjoins an executive course and they offer great season rates. There is an abundance of things to see and do in the area, especially if you are coming for spring training. The Giants Stadium is and easy walk, and, their practice fields are just down the street. Also, it's an easy drive to Talking Stick -- home of the Arizona Diamondbacks and Colorado Rockies. If you want to eat out -- great restaurants within easy walking-- Try Uncle Sals (Italian). All-in-all -- well appointed unit, great owners, super location -- we will be back !